Marko Dugonjić’s typetester gives you instant previews of how a text of your choice would look on-screen set in a certain font and size. It offers full control of the font styling, including the background colour, with the choice of displaying either fonts from your own system or standard system fonts for Windows, Mac or both. If you’d like to see settings from your last visit next time you come around, just enable cookies. 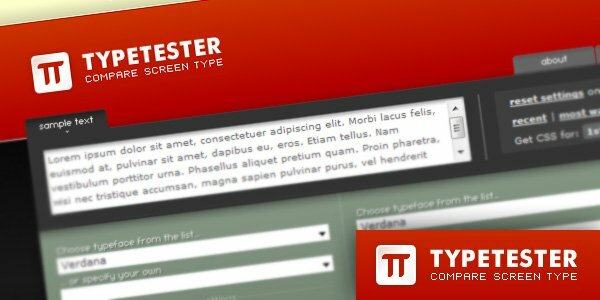 Due to variety of extensions for Firefox available, some extensions could break some Typetester’s functions. Please do report troubles. If possible, provide a list of installed extensions. Even though the application should work on any system which allows installation of the listed browsers, it’s advisable not to run it on a system with processor 1Ghz or lower. Some advanced functionality (like color-picker or client system font-list) might be missing in some browsers. However, all settings can adjusted respectively. Nguyen is inspiration to lot of people like me who are working hard in web development field. I just saw Typstester and its really cool site. Thanks for sharing it, i didnt knew about the site. I will surely look more into it.